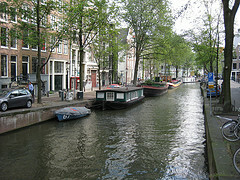 Amsterdam conjures up images of windmills and wooden shoes, canals and bridges... but what will you really find there? "Is it safe to travel there? I've heard they have drug shops and prostitutes... Peter"
Whoa... that's not what we meant when we asked what will you find there? Of course it's safe... and fun. ...but that was only because there were several things we wanted to see in the countryside. We have been before, and we would have gone into the city if we had more time. And windows framed with lace. It's a city full of historic buildings, but it's modern and progressive at the same time. Back in its golden age of the 17th century, sea trade made it one of the world's richest cities. They built them skinny because they were taxed by street front footage. 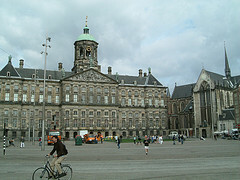 Dam Square is the very center and heart of Amsterdam. If you arrive by train at the Centraal Station, it's about a five minute walk to the square. 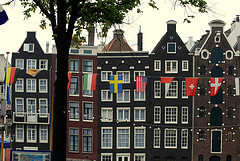 The Dam is surrounded by shops, food stalls and restaurants. It's crowded with locals and tourists all the time... that makes it a good place to find food and meet people. 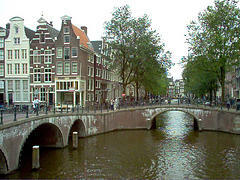 Canals wrap around the square in a big arch. The canals define the city... explore them. If you really want to get into it, rent a houseboat for your stay instead of a hotel or B&B. You can also bike along these streets just like the Dutch do. Amsterdam is a city where bikes outnumber cars. A bike can be a great way to get around. Avoid walking along the bicycle lanes.... They are clearly marked and bikes rule on them. If you end up in one without thinking and hear a bike bell..., get out of the way! We found the Dutch riding bikes everywhere we went in Holland. They takes bikes on vacations, and bikes are cheap to rent or free at many hotels and parks. The museums are open again. Spend a morning examining the masterpieces at the Rijksmuseum... more amazing than ever after a 10 year restoration. Jump to the Van Gogh Museum for the afternoon. It has more Van Gogh's than anywhere in the world... something like 200. Visit the Anne Frank House. See where Anne and her family hid during the Nazi Occupation of the Netherlands, and where she wrote her diary. The tiny rooms are empty, but they will make you stop and think. The original diary is on display. This is a very popular place to visit, and lines can be long. During the summer, the house is open until 9 at night. Consider a late afternoon or early evening visit to avoid the lines. The Old Church and The Red Light District? 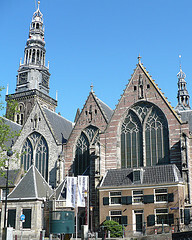 Oude Kerk - the Old Church - is the oldest church in Amsterdam. As a quirk of history and geography, it's in the red light district. Prostitution is legal in the Netherlands. It's well regulated, and the district is well policed. When you're ready for some food and drink, there are plenty of restaurants and bars. Beer is the Dutch national drink. Brown cafes are traditional Dutch local pubs with simple meals, coffee or beer. They may seem old and crowded, but people are friendly, and they can be a real bargain. And then there are the coffeeshops... which aren't what you think. These are probably the drug shops Peter read about and questioned us about above. They too are safe and legal... though the laws are changing on that. 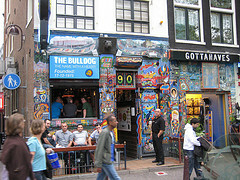 Read our page on coffeeshops to see how quirky the Dutch really are. A trip to Holland wouldn't be complete without seeing a windmill. Other than those wooden shoes, what could be more Dutch than a windmill? There are actually still eight windmills in the city, and you can visit two of them. 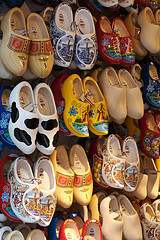 So there you have it... wooden shoes, windmills and all. And if you have some time for the countryside, we can tell you about some day trips or a short driving trip that will take you to more windmills, Van Gogh paintings, and tulips.